YOUR ALL JUST MORE GATOR BAIT! First off, the angry Texas Longhorns fans. "Ohhhh, we got jobbed because we waxed the Sooners on a neutral field." Wa, wa, wa, stop crying. You know even Mac Brown and Colt McCoy have come out and called a spade a spade, if they'd taken care of business in Lubbock, we wouldn't have gotten into this mess to start with. Simply put, it's probably wrong that your watching a team you beat with the same record in the Big 12 title game, but they'd have that same argument in Lubbock if you had moved on. Furthermore, don't think you get off the hook (lame pun, totally intended) that easy. You played absolutely no one in your non-conference battles, and when I say no one, I mean (5-7) UTEP, C-USA Rice, (6-6) Florida Atlantic. I mean really, what did you think would happen when the computers threw those teams in and came out with a higher seeded Oklahoma team. The Sooners welcomed a TCU team that finished the season ranked #11 in the BCS. They thumped Cincinnati, 52-26, who are the Big East champs and currently ranked #13 in the BCS. So when you dry up all your tears Longhorn fans, blame your athletic director because when Florida Atlantic shows up on the caller ID, you shouldn't be answering the phone, your the Texas friggin Longhorns. The Sooners, well your going to win the Big 12 Championship, get a Heisman Trophy in Norman, and then become the next team to feel the wrath of the SEC. No? Okay, we'll see. Why don't you confirm with Buckeye nation how it feels to play the SEC in a National Championship. Underdogs or as favorites, they got tortured. In one of those bouts, they had had a Heisman winner as well, Troy Smith. But your probably right, you aren't a soft and slow Big-10 team, and you have hung at least 35 on opposing defenses in every game you've played. However, the Gator defense hasn't allowed more than 31 points the entire season. The bottom line is, Florida has played in tougher places than Stillwater, College Station, and Manhattan. You lost the biggest game of your season at a neutral site, and only after weeks of crying did supposed "Big Game Bob" stop his campaign to talk you into the Big 12 championship game. What do I have against Oklahoma? Could it be that they legitimized teams like Boise State two years ago at the Fiesta? 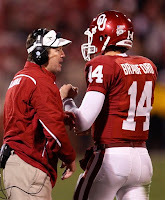 Could it be that they ended the Heisman campaign of Graham Harrell, my preseason Heisman pick? Maybe. This is my problem with the Big 12, and the Sooners get unfortunately lumped in, why is it that every other two division conference goes to head-to-heads to determine their winner, yet you don't? Don't sleep on Chase Daniel. I'm a big fan of Pete Carroll and USC. I think giving up timeouts to wear your home jerseys could be the funniest thing of the '08 college football season, but you shot yourself in the foot, Plaxico style. The Trojans, like the Longhorns, needed one win to take care of business, and they screwed it up. Corvallis might not be the easiest place to play, and I'll agree I thought there was no way you'd lose that game after torching the Buckeyes, but you did. In 6 of your 11 games this season you've allowed 3 points or less including three shutouts and giving up just a field goal to both Notre Dame and Ohio State. When they thought you'd cough it up at Arizona State, you shut up out 28-0. Maybe no one else is impressed that you beat the state of Washington teams, a combined 125-0, but I'm impressed. Some aren't impressed that they covered the biggest spread of the past forty years for a Notre Dame team, 38-3, but I'm impressed. Unfortunately the 2008 PAC-10 is as soft as downey. The silver lining for USC should be that everyone in the country wants to see them in the title game and they'll get another shot to embarrass the Big 10, and lately that's been a theme of these bowl games. Some of these teams will get to actually become Gator Bait, and the first one on that list is Alabama and Nick Saban. Percy Harvin or no Percy Harvin. The Tide are better than EVERYONE thought they were. They haven't lost a game this season, they finished their regular season schedule with zero losses, need me to say it in any other way? They are the only remaining undefeated Division 1 team with any substance, yes, that's right Boise, Utah, and Ball. 'Bama is very good, they have an experienced quarterback under center, John Parker Wilson, dominating receiver in freshman, Julio Jones, and two tough running backs in Glen Coffee and Mark Ingram. They've boasted monster wins at Clemson, Georgia, and LSU. They held four of their last five opponents to under 10 points. That defense is the second ranked defense against the rush and the third ranked overall. The downside, their offense is the 28th ranked in points scored this season and a 22nd ranked rushing offense. To beat a team like Florida, that averages 450 yards a game and 45 points, your going to have to put some points on the board. The Florida Gators. For the second time in three years, they'll hoist the crystal football. Since, their 31-30 defeat to Mississippi in week four, the Gators have been on a tear. In their eight straight victories since that loss the Gators have in a word, dominated. The 41-30 victory 'Bama had at Georgia seems a little downgraded since Florida beat that same Bulldog team by 39 at their place as well. 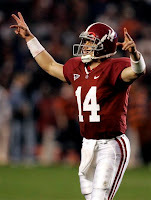 While at the Swamp, Tim Tebow & Co. smashed LSU 51-21, a team Saban and Alabama beat in overtime. Florida en route to the SEC championship game defeated Steve Spurrier by 50 points in November, they outscored in state rivals Florida State and Miami to the tune of 71-18. Tim Tebows Heisman campaign includes 25 touchdown passes, two interceptions, and 2,300 yards passing. Tebow's second straight run at the trophy also includes 507 yards rushing and 12 rushing touchdowns. The Florida offense averages 237 yards rushing per game and allows just 275 yards per game on defense, which is good for the seventh best defense in the country. The Gators have four backs who have rushed for over 500 yards and five backs who have scored 4 or more touchdowns. Reciever/Running Back Percy Harvin has rushed for over 500 yards and caught 35 balls for almost six hundred yards. Find the defense in the country that can hold down this offense. If not for the missed PAT against Ole' Miss, they are the top ranked team headed into this weekends title game with Alabama. That is why the rest of the countries elite is just Gator Bait.